I've been working on more floral paintings, just to experiment with flower styles and improve my decorative painting skills. I cruised through my photos from the last few months, to find SIXTEEN painting projects I haven't shared. Three aren't finished, but THIRTEEN are. I've been meaning to write more, but there's something cathartic about painting things, that I haven't found in writing. I've been dealing with some personal stuff, hence why there are so many painting projects, including FIVE canvas paintings. What is this madness? Who is this person? 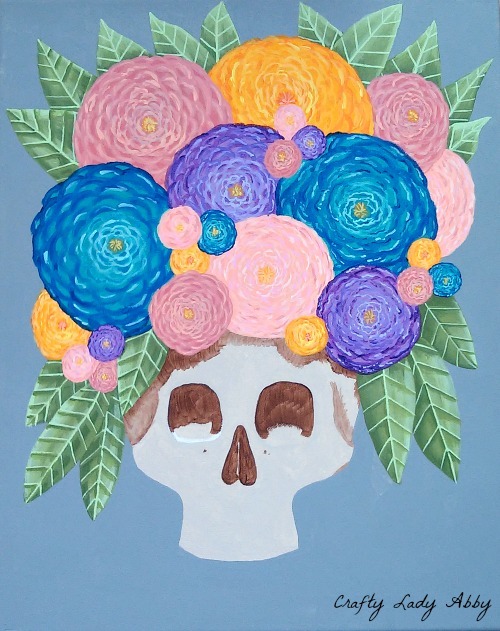 I started this blog as a way of documenting my artwork. It's morphed in a tutorial heavy site, which is still cool, but seems more formal and perhaps a little colder than my past looser creative posts. Fashion sets, where did those go? To be honest, I gained a bunch of weight...over thirty pounds...ditched a bunch of my wardrobe and have been trying to figure out how to dress this bigger curvier body. I love my body still, and perhaps more than before, as it's booty and boobilicous. So anyway, changes have been happening, both bad and good and somewhere in between. I'll stop rambling, and get onto the canvas art. I'll make separate posts for some other projects. At least one has a tutorial. I SWEAR! 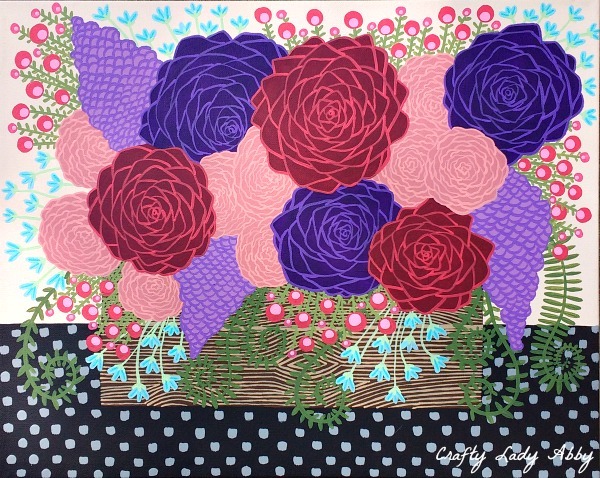 I'd been admiring abstract & floral art from various artists on Instagram. I started with an abstract background, but I wasn't feeling it at all. I stared at it a while, unhappy with it. Then, I decided it might be a cool background for a loose floral arrangement. I threw on a purple vase. Then, pulled colors from the background, plus red, and created layers of flowers, leaves, and sticks. I hung this one by my front door. It's so cheerful and colorful. So the above one was back in May. The below one is August. There are no canvas paintings in between. In that time, I also lost my grandmother, who had Parkinson's, dementia and cancer. In August, we went to Myrtle Beach, SC with friends. We rented a house, and I brought the craft supplies. Sadly, Alex left the big box of DecoArt paints, and painting brushes at home...by mistake. Off to Walmart, we went in search of paints, brushes, and big canvases. About mid-week, I broke out the painting supplies. Us ladies each worked on a canvas. Rachel, came up with the idea to include each person's fingerprints in our paintings. Alex's and Rachel's paintings have our names. Since mine was a floral, I didn't want to put names, so instead I had people use the glitter paints to add their fingerprints. Oh, and this painting started off as a beach scene, which I hated! I painted grey over the whole thing, before the underlayer of blues and tan had dried. 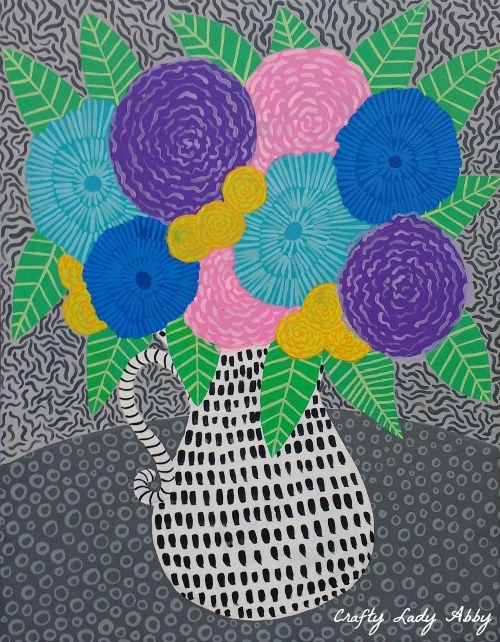 "Floral Arrangement in Glass Vase, with Friends Fingerprints"
The last night of our trip, I still was in a painting mood. I caught the painting bug big time. I started this painting our last night, and finished it my 1st week home. It's much more energetic and simplistic than my past paintings. A big difference from the previous paintings. I'm still working on finding my style. I'm definitely all over the place still. They've all got very positive feedback. I might sell this one. I know, actually selling a painting! Such a weird thing for me. 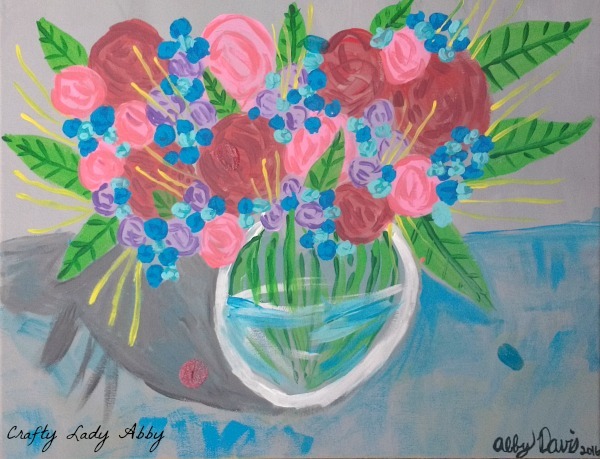 "Floral Arrangement in Water Pitcher"
Technically, this one is unfinished too. However, I just need to highlight the leaves. I got tired of looking at this painting after a week of working on it. There are parts I like and parts I'm enthusiastic about. This one I'm definitely selling, for a few hundred dollars, because of the scale. Actually all three of these paintings are about 20" to 24" at the longest/widest. I did buy some smaller canvases. My motto about painting is that bigger is better, because I can cram in more details. This one is very detail crammed around the outer edge and not so much on the big flowers. Still, people liked it. I cater to my personal likes, more than others. With my crafty and teaching job being a mixture of both my style and the abilities of others, I'm finding it difficult to just throw myself into a painting without holding back on the complexity. "Floral Arrangement in Wood Crate"
That's all for this post. Like I mentioned way at the beginning, there are other art projects I've completed and a couple that still need work...or um UFOs...unfinished objects. If you like seeing my process of creating these, and other pieces of art, check out my Instagram. I like to post projects as I'm working on them, which quite often have at least one cat hanging about. Our dear Aurora moved away with her family, while we were on vacation, so sadly our outdoor projects will be without our fearless black squishy sweetie, always mewing, getting in the way, and sneaking inside to be nosy. 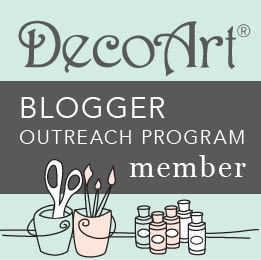 Oh and I won't consider this a sponsored post for DecoArt, because I bought most of the paint...about 95% at least. Whatever you're making have fun with it. Happy Makery!